You are here: Home › Limousine vs Party Bus: Which Ride to Chose for Your Wedding Day? If you are thinking of budgeting for a wedding transportation, you probably think of riding in a classy vehicle. Comfort and style are also factors to consider when thinking of a vehicle for your wedding day. In most cases, some people opt for a limousine while others prefer a party bus for the big day. So, which is the best option for you? Here is a comparison of the two to help you make your choice easy. One of the most annoying things is when your wedding attendants arrive late to the ceremony. So what do you do to counter this? Hire a party bus. The party bus is big enough to carry a lot of people all at once. You could let your family and friends get on the party bus to avoid late-coming incidences or any other related inconvenience. Other than carrying more people than a limo, the party bus will also have enough room for more luggage. #2 How many people will be on the ride? Basically, it isn’t all about getting a vehicle that can carry as many people as possible. Rather, you should consider the number of people you want to include in the vehicle. If you only want less than ten people, a limousine is an ideal choice for your wedding. This could be your bridesmaids only, which can be a great choice for the day. A party bus will be suitable if you have more than ten people. #3 Do you need privacy? 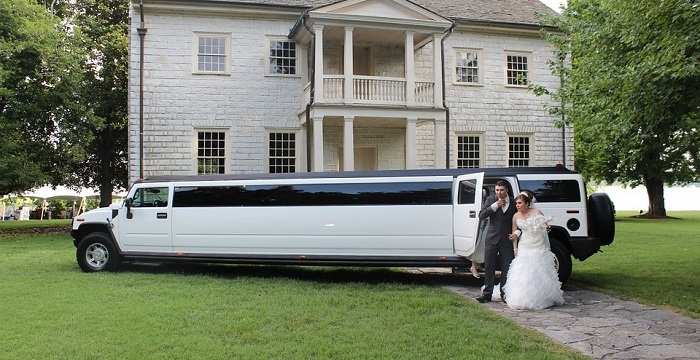 If you need a more private vehicle on your wedding day, a limo is the best choice. With the limousine, you can enjoy your time with your partner without the intrusion of the chauffeur or anyone else. The party bus is less private since it has a huge space meant for partying and moving around with ease. #4 Do you require VIP treatment? While the party bus could be extra roomy and comfortable, the limousine still takes the lead when it comes to luxury and VIP treatment. The limo will come with a professional chauffeur, who will serve you accordingly, and can even go further to offer you impeccable VIP services. The party bus will not have such services since there are a lot of people on board, who are only there to have fun. When choosing the best wedding vehicle, the bride and groom should weigh the options and go for the best. Also, for an after party, the party bus is the best choice. The mood doesn’t have to be wild when attending a wedding, which is why most people opt for a limo for their wedding. All in all, ensure that you make your choice wisely. To find top local limousine companies in your area, search the best limo service providers through our directory. Contributor: Abiding Limousines is a reputable Houston-based transportation company. They provide various transportation services such as: limousine service, party bus rental, airport transportation and more. To learn more about them, visit their official website at abidinglimo.com.